Tuesday morning brought me a dentist appointment and general work-related ennui . But even Tuesday mornings eventually turn to noon and noon comes with a friend - lunchtime! Today we visited a modest little Chinese place with a modest little name - Xi'an Food Bar on the corner of Anzac Ave and Customs St East. It doesn't look like much but Xi'an Food Bar has two standout features. The first is that you sit at your table and order via a strange retro-futuristic device that looks a bit like a calculator. The waiter gives you a menu but rather than place your order with the waiter when he returns, you type in the number that corresponds to your chosen meal into the device. 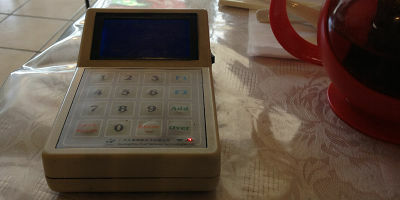 Once everyone has chosen their meals the device transmits your table's orders to the kitchen. A kitchen which is all of 3 metres away and clearly within sight. This manner of ordering is completely silly and quite wonderful. It feels like you have walked into a cheap 80s scifi movie. I plan to go back on a rainy evening and pretend I am hunting replicants. 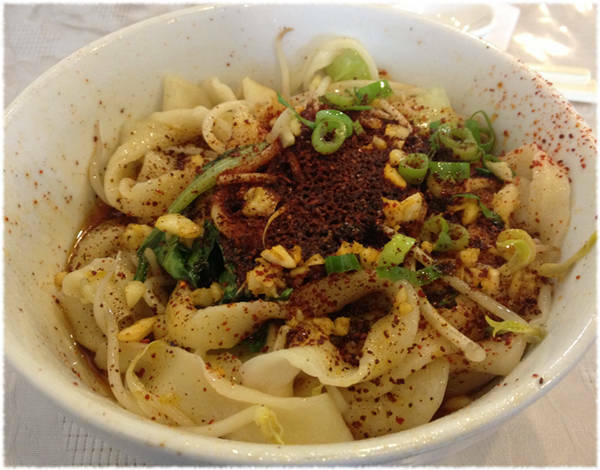 The other great thing about Xi'an Food Bar is that they make their own fresh noodles. The service is very quick, and in a couple of minutes you will have a fresh bowl of lumpy noodles covered in tasty sauce. The flavours are strong but well balanced, and the texture of the noodles is very appealing. The first time I went I made the adventurous mistake of ordering the sliced pigs ears. It wasn't the worse thing I have eaten, but even the best sauce in the world couldn't make a silk purse out of that. I think it is probably meant to be a side dish. So long as you keep the pigs ears to a minimum, Xi'an Food Bar is worth the walk. Get there early though, it gets busy.